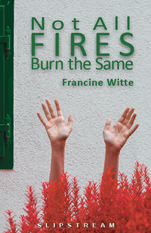 "Welcome to the poetry of Francine Witte where, for better or for worse, anything could happen. It’s a world of hurt and bedazzlement, of pain and possibility–of pain sisters and wounded wives. Of laughing hurricanes and sky in your coffee cup. Of streets woven of bones and ash, and moons that know better than to stick their noses into every other sentence. It’s a world of uncertainty yes. But also insistent pull. Where, whether it is a lover’s heart or the outstretched neck of a race horse, anything could turn a sure winner into an also ran or back again. This is Francine Witte’s world. Weigh the odds, take your chances, put your money down. Take comfort in knowing that it may not always be pretty but–for once in your life–you can get the whole, clear view…rather than how we too often find things, spread out in a million different directions, all of them going nowhere." Francine Witte grew up in Queens, NY. She earned her MA in English/Creative Writing at SUNY Binghamton and her MFA in poetry at Vermont College. She is the author of the poetry chapbooks Only, Not Only (Finishing Line Press, 2012) and First Rain (Pecan Grove Press, 2009), winner of the Pecan Grove Press competition, and the flash fiction chapbooks Cold June (Ropewalk Press), selected by Robert Olen Butler as the winner of the 2010 Thomas A. Wilhelmus Award, and The Wind Twirls Everything (Musclehead Press). A former high school English teacher, Francine lives in New York City. bedrooms all day, she starts to dream. wedding china she uses every day. on the couch like a heavy carton. can’t help but wonder what’s inside. at them like a blank, unfurnished room. of a dream, but it’s the one I really want. A quiet sleep followed by not much of a morning. this street would really go. forest scorch, flames like wolf tongues. could taste the ashes still in his mouth.